The Twin in Berlin: NOTHING SEPARATES THE DREAM TEAM, NOTHING I TELL YOU NOOOOTHING. NOTHING SEPARATES THE DREAM TEAM, NOTHING I TELL YOU NOOOOTHING. TODAY IS THE 9TH WHICH MEANS NEXT MONDAY IS THE 16TH!!!!! I made a countdown and hung it on our wall, starting with 18 days i think...only one week more of being this teenage mädel. what a life, what a life. also HAPPY BIRTHDAY BRODY!!!!! I totally made a note to send that last week, but I didn't! Stoked that you will be there for his baptism!! How fun!!! Oh my gosh can we all just take a moment to acknowledge hermana megan's pics?? awww they made me miss her soooo much! it is so weird just seeing pics of her and thinking that she is doing the exact same thing a world away. NOTHING SEPARATES THE DREAM TEAM, NOTHING I TELL YOU NOOOOTHING. Anyway...on a more controlled and serious note. we had interviews with President Kosak this week! our zone training meeting was in hamburg. ( pops the chapel in that one pic awhile ago was the hamburg wartenau chapel.) I always get so nervous right before hand, well especially because I knew he would ask me to teach a 3 to 5 minute lesson in german on one of the first 3 lessons, but when i get in there and sit across from him, it's all goood. Just peace and ruhe. I just smile the whole time, oh my goodness i love him so much! he is so funny and full of the spirit!! That was probably the best part of my week! haha i taught him lesson 2, secretly what i was dreading as it is the hardest for me to keep short and simple ESPECIALLY auf deutsch. BUT he complimtented my german and teaching skills. We had a good time together. Just spending time with him lifts my spirits and entire being pretty much. So the transfer ends two weeks from today, president hinted to me and sister murdock that she will be leaving: super saaad! But so is it in this life. I mean unlike dear hermana megan who is still on her first comp, i might be getting my 4th, haha 6th if you want to count the mtc...I love getting new comps though, and the Lord is in everything. No worries. Yesterday we didn't have anyone at church, but we still taught our investigator class. the elders had a recent conver there, and then an investigator. both who speak english as a second language. then our gml, who doesnt speak or understand english, then a ward missionary, this recent convert of about a 1 who speaks english, but in a precious way that makes me want to crack up when he talks, and then this other ward member who can understand but not speak so much. so they all sat in the first two rows of the room, and we just across from them. it was quite a funny site and event. 7 men getting nurtured by the good word from the sisters. hahaha not sure what percentage of the class actuallly understood it all. doch, the elders of course, and the new convert and their inv seemed to enjoy it. then there was the ward missionary who said "amen" after i said something good. haha I love church! laaater we were klingeling and this dude answered the door. we said we had a besondere botshaft about Jesus Christ and the family. he said okay he was interested. so there in the doorway we asked a few questions just to see what he believed in and alles ging los from there!!!! oh man i think we were standing there for about an hour at least! His wife, they were both early twenties, came and was participating too. we were talking about the Priesthood and the Book of Mormon. So as I mentioned maybe recently our mission is reading the BOM this year. Just a day or two ago we read 2 nephi 29, talking about those who will say " a bibel a bibel, we have a bibel." and what not. oh i meant bible. then the Lord slams down with the truth. GOOD STUFF. Sooo of course when this dude started saying pretty much this scripture directly, the thought came to my mind to read it. hahahaha as I read it I didn't dare to look at him. But dont worry it wasn't in a bashy way at all i promise!! Oh man it was a looong conversation. they were really nice and genuinely interested in getting to know what exactly we believed in and what we thought about what joseph smith has "claimed" to have seen. There were several points in the conversation where I was like, "wow thank you Holy Ghost for helping me with my German" I TOTALLY was aware of the Spirit guiding us. At the end of the conversation this guy was just like, I dont even know what to say. He wouldn't take a BOM, but we invited him to at least pray about it, that it could be true. After we left we could not stop talking about them!!! It felt so good to be able to share my testimony that I had read and prayed about the Book of Mormon, and received a confirmation through the Holy Ghost that it is true. Nobody can deny our own testimonies. I am sooooo grateful for my testimony. I KNOW THE CHURCH OF JESUS CHRIST HAS BEEN RESTORED THROUGH A PROPHET. ich weiß dass die kirche, die Jesus selbst gegründet hat, wieder auf der Erde ist. mensch! what a wonderful thing it is to have a testimony!! Thanks for the emails momsy and pops. Loooove them as usual!!! I missss you!!! 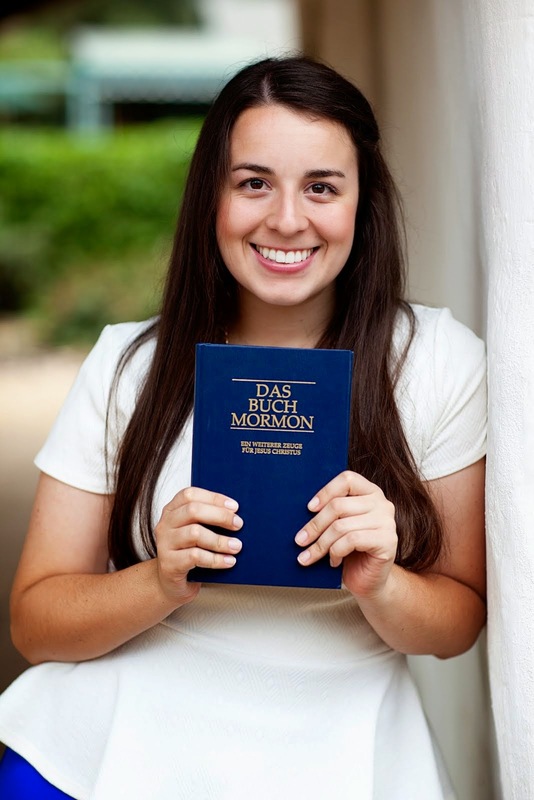 I looooove being a missionary in Germany!!! I JUST LOVE IT. Stay real and stay close to Heavenly Father! The next time we hear from each other, I will be 20 WOOHOOOOOOO.